James is a couple of years younger than Red, but both boys help each other out on various tight spots throughout the adventure. Red first meets James in London as he sneaks aboard a train to Scotland. Later the boys work together to locate Red's missing cousin Alfie. Soon they discover that not everything is what it seems at the Hellebore's Castle, and Alfie could have strayed to oclose. Using his street smarts, Red helps James sneak onto the Castle grounds, where Red breaks his leg, but does not make a sound so as to prevent them being captures. Red is quickly besotted with Wilder and her green eyes, but he hates being in the open country side and prefers the streets of London. George is James' rival and cause of a lot of problems during his first year at Eton. He is older than James and is protected by his powerful and respected father who is feared at Eton. George pits his wits against James after pushing him around during the cross country race, and a rift becomes apparent between George and his father when he is forced to take a mysterious pill before the race. Failing to win the race exacerbates the problems between Lord Hellebore and his son. Upon his return to Scotland, George spends most of his time with the castle grounds. When James needs help from George, he turns his back letting his father and scientist experiment on him. Realising what his father has been doing, and how poor he treated his mother, George agrees to help James escape and destroy his father's terrible work. After the destruction of the laboratory and experiments, George and James part as amicable friends. George leaves to head back to America where his mother resides. Upon returning to Eton, George 's friends are none the wiser to his disappearance and look respectively upon young James up after hearing rumours of his involvement. Lord Hellebore is a rich and powerful man who made his money developing and selling weapons in America. Divorcing his wife and bringing his son alone, he brought a Scottish castle and a lordship title. He is a patron of Eton he provides finical assistance to the school, which also gives him power and respect. He has an active interest in George's well being until he loses the cross country race. He secured his castle from prying eyes when Randloph began working with his brother on the Silverfin serum. Obsessed with perfection and developing the serum, he allowed it to consume his brother, his son, and himseld. Both he and his son took tablets version of the serum, as well as his obsession leading to experiments on animals and humans. Randolph loses everything towards the end, including his life, to his tortured brother who he abused and neglected after the failing of the serum. Wilder is a young free spirited Scottish girl who makes a few appearances during the boy's adventure. Red is soon besotted with Lawless and her striking green eyes and long hair. She spends all of her free time with her horse Martini roaming the open moors. On parting, James receives a kiss from the more mature Lawless, and the door is left open for her possible return in a future Young Bond adventure. Pritpal is a fellow room mate who helps James learn all the inner workings of Eton and some of the more obscure traditions. Pritpal is a maths and science genius but has little interest in his studies - and more in food. James and Pritpal hit it off instantly, and their friendship is bound to grow throughout the Young Bond series. 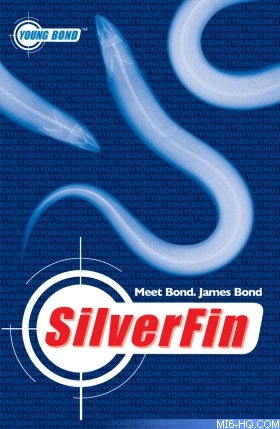 In the epilogue of Silverfin, Algar saves James from loch Silverfin and establishes James' dislike of eels. The taller and (orginally) more handsome twin brother to Randolph, Algar was the true brains behind the SilverFin serum. Through his obsession with the serum, he tested it on himself which resulted in his physical appearence. The serum transforms him into a monster, however, of the two brothers he is the most compassionate, and saves James. Mr Merriot is James' classical tutor who is responsible for overseeing James' educational curriculum while at Eton. Mr Merriot is also in charge of the school athletics program and spots young James' potential as a long distance runner and encourages him to partake in a prestigious cross country race. Aunt Charmain is James' loving legal guardian, following the loss of his parents. he has been responsible for James' education and upbringing. She is fiercely independent and strong minded. She treats James as an adult and loves him unconditionally. Suffering from lung cancer, Max shares a strong "bond" with James through SilverFin. Max spends some quality time with James teaching him how to drive and the finer points of fishing and relaxing. Before passing away, Max shares some of his darkest secrets with James of his role as a spy during WW1, and how he never gave up and managed to escape his captors.